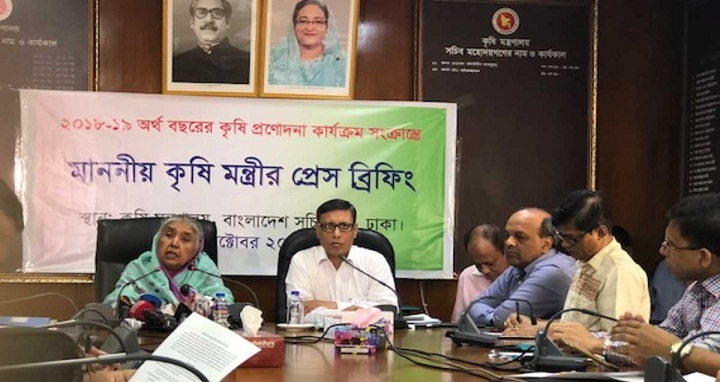 Dhaka, 7 October, Abnews: The government on Sunday announced a Tk 79.99 crore incentive for 6,90,970 farmers across the country, aiming to increase the production of 11 varieties of crops. Agriculture Minister Matia Chowdhury came up with the announcement at a press briefing at the secretariat. The farmers will get MOP and DAP fertilizers and seeds to cultivate 11 kinds of Robi crops in a bid to increase the cultivation of these crops and to recoup the damages caused by natural disasters, said the Minister. The crops are wheat, maize, mustard, peanut, felon (puse), pulse (Khesari), BT Brinjal, boro paddy, sesame and both winter and summer pulse (moog). The government will provide 20 kgs seeds, 20 kgs of DAP fertilizer and 10 kgs of MOP fertilizer at a cost of Tk 1,965 to the farmers for cultivating wheat on one bigha of land while two kgs of seeds, 20 kgs DAP fertilizer and 10 kgs of MOP fertilizer at a cost of Tk 1,302 for cultivating maize on one bigha land, said Matia. One kg of seeds, 20 kgs of DAP fertilizer and 10 kgs of MOP fertilizer involving Tk 786 to the farmers for cultivating mustard on one bigha land while 10 kgs of seeds, 10 kgs of DAP fertilizer and 5kgs of MOP fertilizer involving Tk 1,563 to the farmers for cultivating peanut on one bigha of land, she said. The farmers will get one kg of sesame seeds, 20 kgs of DAP fertilizer and 10 kgs of MOP fertilizer at a cost of Tk 792 while five kg seeds of pulse (moong), 10 kgs of DAP and 5 kgs of MOP fertilizers at a cost of Tk 935 for per bigha of land.